It may not come naturally to think of the approximately 100-acre open-space corridor between Strachan and Bathurst, north from Coronation Park through Fort York and Stanley Park to the gates of Trinity Bellwoods Park, as a system of green stepping stones through the city, but this condition is emerging. Understanding our downtown open spaces as green pathways through a grid of buildings and flanking streets, and now including the significant 7.4-acre area added in August 2014 when Toronto City Council redesignated the “Employment Areas” south of Wellington Street West between the Destructor and Strachan House, is to broaden our understanding of what Toronto is and may be. 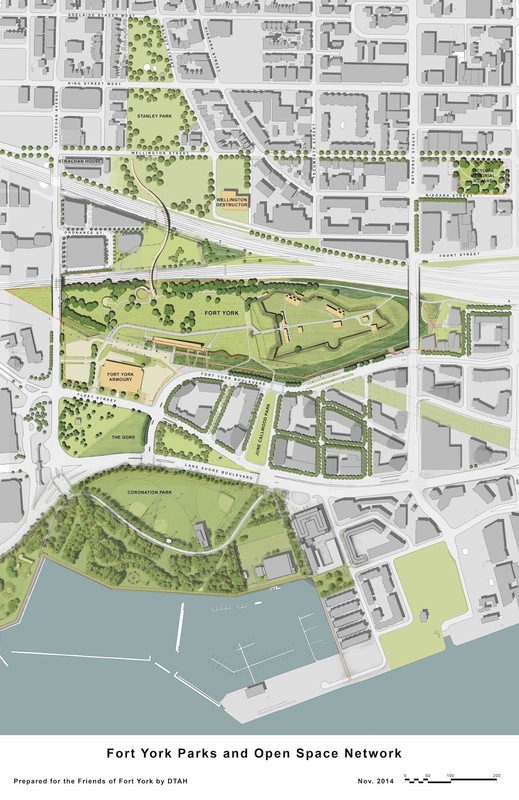 This Open Space Network plan is a major step forward in capturing the potential for sustained city-building that can take place over the next decade. Click the map to view a full size version (Note: The map is quite large in area; you may need to use your browser’s zoom or scrolling controls). Prepared for the Friends of Fort York by DTAH, Nov. 2014. Image courtesy of Friends of Fort York.